Hiring a vehicle for special occasions like weddings, birthday parties and other important executive events is becoming increasingly popular in the UK. Hiring a vehicle is no more an expensive affair limited to stars and the elite. At Crystal Chauffeurs you will be able to find affordable executive car hire Milton Keynes services for all your transportation needs. We come with several years of experience in offering car hire services in and around Milton Keynes. We are a highly professional limo hire service provider that caters to wide range of luxury transportation needs. We have an exceptional range of limos in our fleet. Each customer comes with his or her own preferences and we make sure that we meet your needs in the best way possible. We accommodate all your needs. When you approach us with your own limo hire Milton Keynes needs we do not try to shove down your throat our rigid packages. We offer fully customised limo hire services. You will therefore be paying just for what you use, we will tailor our services to your needs and not vice versa. We set our services one cut above the rest in a number of ways. We have our own fleet of limousines and highly regarded vehicles, our fleet is regularly updated with the latest selection of cars. At Crystal Chauffeurs you will have access to all the latest limousines in the market. You can now drive in style in your favourite limo. In our large fleet of limos you will find a limo that suits your every need and preference. If you are not sure which limo to hire you don’t have to worry, share your needs with us and we will recommend the best fitting limos for your needs. 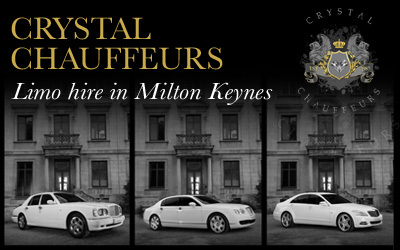 Crystal Chauffeurs makes the whole process of Executive Limo Wedding Car Hire Milton Keynes very simple and easy. Just make a single phone call and have your limo booking confirmed within a short time. All of our vehicles are in perfect condition as they are well-maintained and serviced regularly. We will send you a tastefully furnished car with a highly experienced chauffeur. If you want to arrive in style on your special day, choose our Executive Car Hire. You can also hire our executive cars for promotional events and road shows. Our vehicles will help you elicit a lot of attention that your brand deserves. Our executive cars will help you make your promotional event a grand success. If you want to give your VIP guest, VIP treatment, then we have a large range of executive cars for hire in Milton Keynes to make this a reality. Impress your guests by having them picked up from the airport to their destination in luxury style, it will give a long lasting impression from the word go on their visit. We also have party buses if you are looking for luxury transportation for larger groups. We also have something special for your transportation needs for sports events. Have fun booking our luxury vehicles. Crystal Chauffeurs as your trusted service provider offers very transparent limo hire solutions. You will not only find our tariffs very affordable but you will also find our pricing structure very simple and easy to understand with no hidden charges. Contact us today for all your Executive Limo Wedding Car Hire Milton Keynes needs and enjoy the best services. We assure you complete satisfaction.